...During a Cuba-Netherlands game that was being played in Puerto Rico, a fan behind home plate raised a sign that read “Down with Fidel” when translated to English. 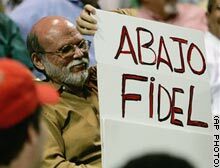 The game was televised to different countries, so the authoritarian Cuban officials who were attending the event felt it necessary to apprehend the sign-holder and silence him as soon as possible. ...That’s when Puerto Rican police intervened and reminded Castro’s cronies that they weren’t in Cuba and couldn’t enforce Cuban law on foreign soil. In fact, the Puerto Rican police took the vice president of Cuba’s National Institute of Sports to the police station and told him the rules of free speech, given that it’s a foreign concept to him. ...What about the people who defect, Mr. Castro? Are they engaging in these cynical counterrevolutionary provocations, too? I’d also rhetorically ask about the people who are still in Cuba and have spoken out against the state, but they’re probably not engaging in much of anything if they’re in prison or dead. i am humored that these people tried to enforce cuban laws and standards in puerto rico, a u.s. territory no less. how warped their world view must be and how much unbriddled power they must have in their daily life to have the audacity to do what they did on foreign soil. all the more reason to feel sorry for the average cuban living under the heels of such oppression. What's sad is that only on foreign soil, when they've traveled to watch a baseball game can they get out their political opinions. The authoritarian mind knows no bounds. I won’t be surprised if one or two members of Cuba’s team aren’t around when it comes time to return to the workers’ paradise after the tournament is over. Being this close to defecting has to be a little tempting at the least.